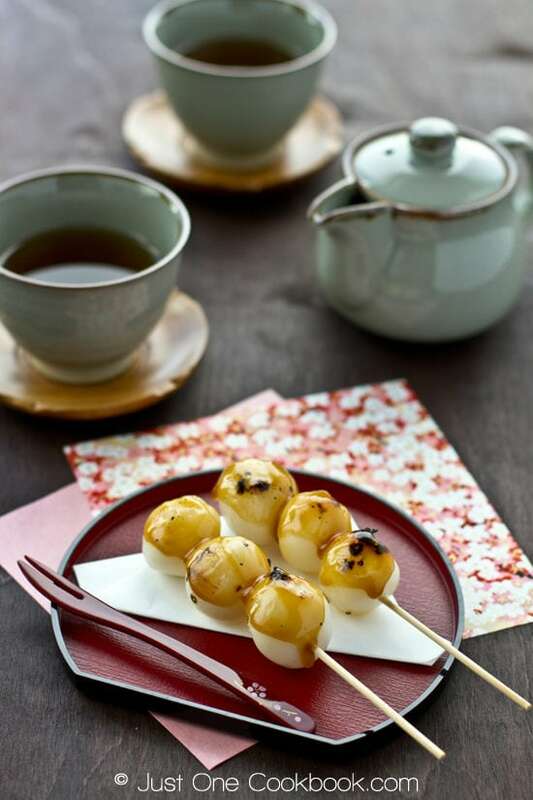 A traditional Japanese sweet, Mitarashi dango is made of warm soft grilled mochi ball covered in a sweet soy sauce. While we celebrated Cinco de Mayo last weekend, the Japanese celebrated the Children’s Day (formally Boys’ Day) on May 5th. Even though that was over a week ago, I didn’t have a chance to talk about it until now so let me share what I prepared for the celebration. In Japan, there are several annual celebrations related to children on which we decorate our houses with special displays. On The Doll’s Festival (Girl’s Day) in March, we would display the set of the traditional Emperor and Empress dolls dressed in kimono. On the Children’s Day, we would display Kabuto (ancient Japanese warrior helmet) and armor. Usually on this day the Japanese eat Kashiwa Mochi (柏餅 picture above). 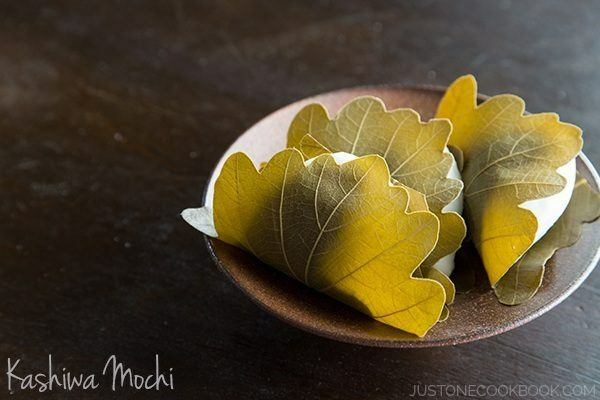 It’s a round shape mochi filled with anko (sweet red bean paste) and wrapped with an oak leaf. I tried to find oak leaves at every Japanese supermarket in my area to make Kashiwa Mochi, but had no luck. So in the end, I just bought the premade Kashiwa Mochi from the store and I decided to make a different wagashi (Japanese sweets) to share with you. This sweet is called Mitarashi Dango (みたらし団子). It’s a type of dango (sweet dumplings) skewered onto sticks. 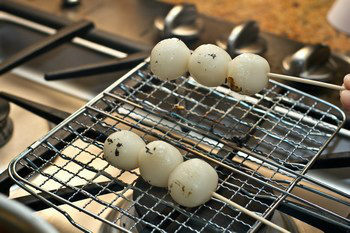 Usually there are 3-5 dangos (traditionally 5) on a skewer and covered with a sweet soy sauce glaze. 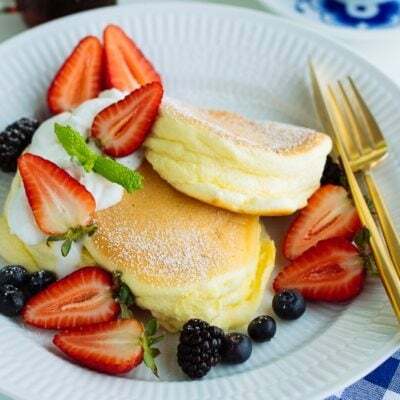 The ingredients are similar to Strawberry Daifuku (Strawberry Mochi), but it is much easier to make. What I like about mitarashi dango is its contrasting textures and flavors. The chewy dumplings are mildly sweet and they get a hint of smokiness from grilling. When brushed with the caramelized sweet soy sauce, each bite is gooey, savory and satisfying without being overly sweet. They make a fun, delicious snack to go with a hot cup of green tea. 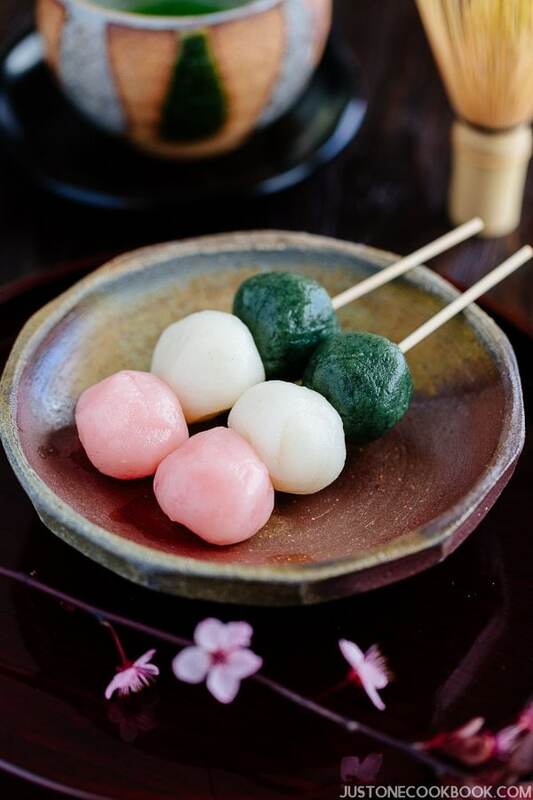 Mitarashi Dango was originated from the Kamo Mitarashi Tea House in Kyoto. It was thought to be made as an offering for gods and the name was given after the bubbles of the mitarashi (御手洗) (font of purifying water at the entrance of a shrine) of a famous shrine in the city. The street vendors in Kyoto started selling it as a snack and became popular amongst many visitors. Today you can find mitarashi dango being sold at supermarkets, convenience stores and specialty sweet shops everywhere in Japan. Joushinko or Johshinko (上新粉) that is made from regular Japanese short grain rice. Shiratamako (白玉粉) which is glutinous rice flour (also known as sweet rice flour). The combination of these two flours will give you the bouncy, chewy but not too sticky texture for the dumplings. You can find these flours at your local Japanese grocery store. I hope you have fun making these traditional sweets of Japan. If you like anko (sweet red bean paste), you can put your homemade anko on top of the dango to enjoy too! Combine Shiratamako, Joshinko, and sugar in a bowl. Stir in warm water a little bit a time and knead slowly until the dough becomes smooth. The texture is like squeezing an "ear lobe" (that’s how we describe the tenderness for this type of mochi in Japanese). Divide into 2 equal pieces until you have 8 balls. Then divide each one into 3 equal sized balls. You will end up with 24 pieces. Gently place dango in the large pot of boiling water. Dango will stay on the bottom first but they will start floating on the surface. Then cook dango for 1 minute. Remove from pot and transfer into ice water. Drain well and put three pieces into a bamboo skewer. [Optional] On the stove top, place the skewered dango on the grill on direct heat over medium high for 4 minute and rotate slowly to char (or you can heat a frying pan and brush with a little oil and grill on it). 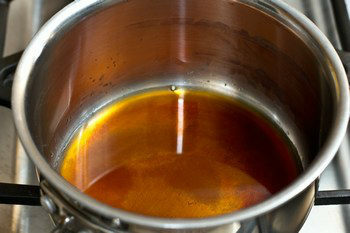 For sauce, combine sugar, soy sauce, mirin and water in a saucepan. Stir occasionally and bring it to a boil. 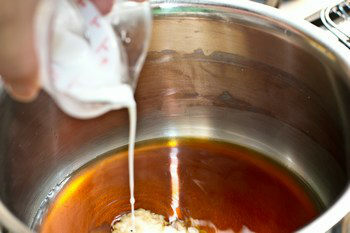 Once it boils, add the corn starch and water mixture to the sauce and make sure it dissolves well. After the sauce thickens, turn off the heat. Place dango on a plate. 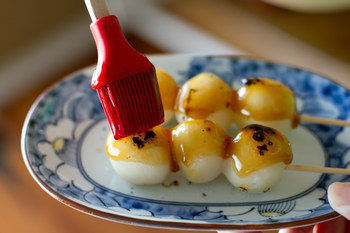 Using a brush, coat with sweet soy sauce on dango. 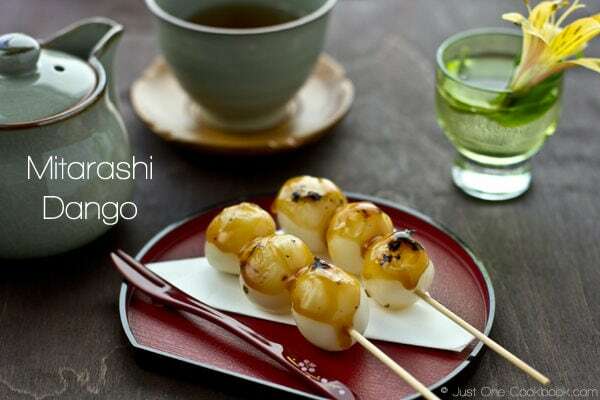 Serve dango with green tea. Shiratamako and Joshinko: Shiratamako is from sweet rice/glutinous Japanese short grain rice and Joshinko is from regular short grain Japanese rice. These flours give different texture. When you make dango with only shiratamako, the texture tends to be too soft. Therefore we usually add Joshinko to make the right dango texture. Of course you can make dango with shiratamako only. It's just the personal preference. 1) After you form into round dango (Step #3), you put them in a single layer in air tight container. Freeze up to a month. 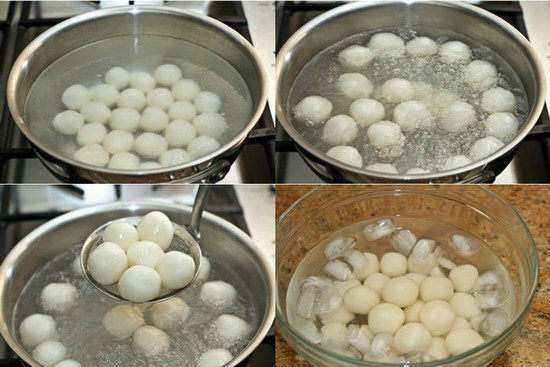 When you use them, boil the frozen dango without defrosting. 2) After cooling down (Step #5), pat dry and pack into air tight container without sticking to each other. Freeze up to a month. When you use them, microwave till they are at room temperature. 3) To keep just for few hours, you can save them in ice water, or in water kept in refrigerator. looks delicious! I’m not sure where to get Mirin though – is it possible to replace it with something else? Hi Nami,do you think you could be more exact on the amount of ‘more sugar’ needed to replace Mirin? Can I substitute the vegetable oil with olive/sunflower oil instead? I love this!! I used to buy this at Takashimaya supermarket until the japanese store there stop selling it! I love the ones with the red bean paste smeared on it..i always buy 2 sticks, one the usual one and another the green tea version. 🙂 So delicious! Now looking at your photos makes me crave for some. I think i just have to make myself some using your recipe! 🙂 Thanks for sharing! If i want to make green tea version, i just add some green tea into the paste right? What on earth am i talking..i think i m too excited looking at your Anko Danko! Sorry, what i meant is if i want to make the green tea version, i just add some green tea powder into the dough right? LOL! Haha, no worries! I understand what you meant. Yes, add 1-2 tsp. 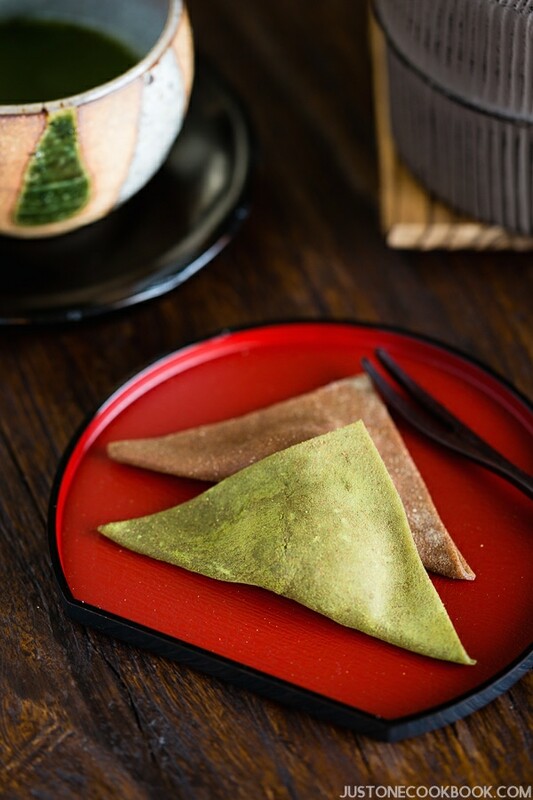 green tea powder in the mixture of Shiratamako, Joshinko, and sugar. Mix and then start adding warm water. Enjoy! yum yum yum! These look amazing, Nami! But I’ve got to tell myself to STOP looking at food blogs when I’m hungry! haha..
That looks so good Nami! How I wish I can stay in your house and enjoy your cooking! oo this looks like a version of our “sweet glutinous rice balls”!! I love how you grill it and add the sauce or with red bean! I want to try this!! Wow. Yummy! It’s similar to what I eat called tang yuan as a Chinese. Yours has a few extra steps but looks so much more sumptuous. These are so elegant and fun!! What a great combination of flavors. These look sensational! Never had them before, but I’m tempted to try! Is it fine to use chinese type of rice flour ? These look fantastic Nami. There are so many foods that I have not heard of before and would love to try. I love the idea of children’s day! I hope you (and your kids) had a wonderful one!!! AND I hope you had a great Mothers Day yesterday! What an interesting dessert! I bet it is delicious. Especially right off the grill! What a great tradition and even greater recipe. I love mochi. I didn’t realize you could skewer the little balls. Must try this recipe when I grill again. Thanks for sharing, Nami! Love learning more about your traditions! I have not had mochi but have heard of it. I think that I need to get adventurous and make these. Beautiful photos!!! In India we celebrate children’s day in November. I love these dangos. I think I can try these .I have everything even glutinous flour. Your dumplings look just perfect, and I love your tea pot! They almost look caramel-y! Your photos are just brilliant, Nami! I have to try this..sound simple enough so I can dare myself to make it:) Loving your photos, Nami! This is a new recipe to me. And it looks wonderful! Really great information in this post, and the pictures are incredible. Really good stuff here – thanks. I didn’t know these dango were cooked in water–I thought they were just grilled after being steamed. 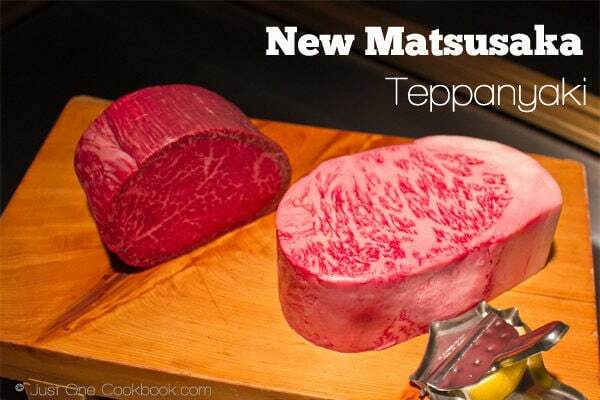 I love the char broiled mark and taste. Hoping to try these after seeing your wonderful tutorial! Thanks, Nami! Hi Donna! Yes there is another way to make which is to steam first. However it’s so difficult and hard to handle the sticky mochi, and for home use (small amount), this method I showed is more common and widely used I think. :-). What a fun pairing of recipes to celebrate Children’s Day! 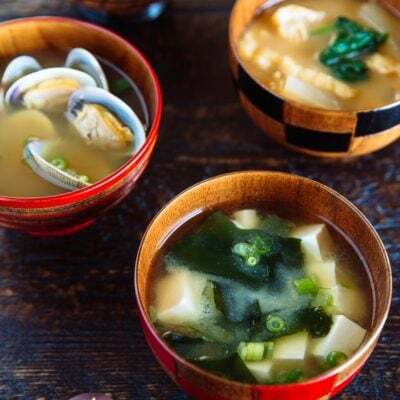 Thank you for introducing me to a new tradition and new recipe, Nami! Oh everytime I’m visitng I feel like a whole new world is in front of my eyes! Loved the post Nami, it’s so interesting to learn things about Japan, and the dessert looks delish! Nami, I love everything that has mochiko…love the texture and the flavors of these treat…savory and sweet…yum! i’ve never had anything like this before but i would love to try! sounds simply delicious! Sweet dumplings on a stick, how great is that?? Love learning about Japanese tradition, it is such an enjoyment to read about it in your lovely posts! Thanks, Nami! Your pictures are stunning Nami!! Thank you for sharing this very special dessert!! I also am so intrigued by the sweet soy sauce. Hope you had a wonderful Mother’s Day!! dumplings, stick, sweet, delicious and cute! What more could you ask for? I love this! So creative and fun! hope you had a wonderful mothers day! I’ve never heard of these holidays – I love learning new things about Japanese culture! What a gorgeous dish. Your photos are always so stunning Nami. That is a neat holiday that you have a children day. Very interesting sweets that really doesn’t seem to difficult to make. I bet your kids love having Japanese holiday’s along with American celebrations. Love the look of the dango – never heard of them before really but they sound great! looks especially tasty…wish I could reach thro’ my laptop for a taste..LOL..! Nami this is fabulous. I bought some red bean paste recently. I love how pretty this is. Thanks for sharing more about your culture as well. I did not know anything about Children’s Day so this was a great read. Your glutinous rice balls sound so easy to make, i like the red bean paste put on top, must find one day to make this. Oh my – what a mouthful of sweetness! These look SO good and I love the sweet sauce! Someone has already used the word ‘elegant’ for this dessert recipe. May I concur!! To use soy sauce for such an offering seems so strange that this non-sweets eater just HAS to try for herself 🙂 ! Hi Nami! This recipe looks so great! Reminds me a bit of the sesame rice flour balls my Mom and I made together, and who doesn’t love sweet rice snacks! It’s so adorable there are separate holidays for boy and girls, I remember back at Taiwan where was a Children’s holiday April 4th), parents would take the kids to the zoo, movies, etc, we always looked forward to that holiday. Hope your children love the celebration you put together as much as I did! These look delicious and so delicately made! I love glutinous rice and the Japanese does such a great job with it in their cuisine. Wish we had more Japanese restaurants/grocery stores here in Australia :(, I remember seeing a lot more of them when I was in the US recently. Nami, not only have we posted skewers the same day, not only are they both Japanese (well mine partly…) but they look so similar! If someone told me these were konnyaku balls glazed with teriyaki I would think they were maybe rounder, maybe whiter, but I would certainly believe! They look absolutely delicious and intriguing for someone who has never had teriyaki glaze in a sweet dish. I think I must start making sweets with sweet rice flour. What a great way to have stickylicious dumplings! I can just imagine the texture of this topping it all off with that beautiful glaze. WANT. NOW. RIGHT NOW. this is yummy! reminds me of how we chinese make tang yuan, though that is done purely with glutinous rice flour, so I think the texture will be different. A favourite snack shop in SIngapore sells these little skewers, dusted with roasted sesame seed powder, matcha powder etc. I think that may be korean in nautre though. Funny how all our cuisines overlap! 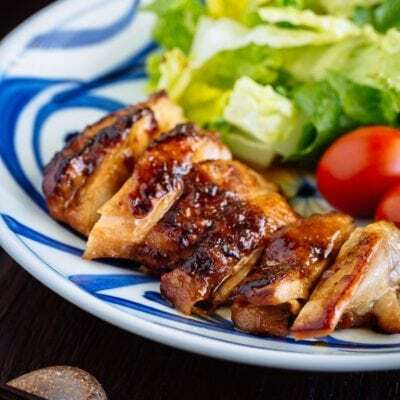 This oen with the sweet glaze looks delish, sticky and savoury and sweet, reminds me of teriyaki! These are so beautiful! 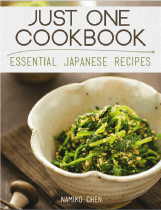 I love learning about your Japanese traditions mixed in with your recipes. A day just for boys? And another for girls? How wonderful! What a great snack, it must filling to just having only 2 skewers. I really like the ingredients for the sauce. Looking at your mochi balls really want me to make them, so pretty! i thought at first this was a savory dish, but it’s a sweet one instead! beautiful presentation, Nami. i totally adore Japanese celebrations! You always pay attention to aesthetics and things of beauty! 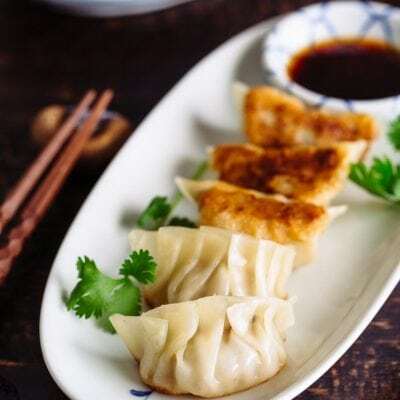 The glaze drizzle on those dumplings looks so sweet and perfect! Every time I visit your blog, I get hungry. You really make such yummy food and take some of the best photographs ever. This dessert reminds me of cake pops. Japanese version of cake pops and they look so phenomenal. Would love to have one now. I love japanese desserts, these sound amazing and it looks easy to make! Now this dish is such a beautiful deliciousness… I am really craving this even though I have never tried this before!! I really love the chinese style glutinous rice balls that’s somewhat the same but not grilled. I don’t know how you do it, but everything your hand touches become so pretty! Too pretty to eat in fact!! These look wonderful Nami! I love learning about different traditions you have in Japan. I always learn so much from your blog, I love it. I have never even heard of these little things, but I would love to try them! Oh yum! Have you ever used kecap manis in the glaze or would that make it too thick? I love glutinous rice desserts, they’re always so tasty. How fun it is for the children to celebrate the special day! I remember eating lots of sweets & junkie food in school on Children’s Day. Nothing traditional or interesting practices though. Must be a bummer that you cannot find oak leaf there. I know I’ll miss lots of ingredients when I move back. Hmmm..I love the look of the dango treats. They are really beautifully made. I am a fan of sweet and salty savory snacks, so I’d absolutely give the sweet soy sauce one a try! Beautiful pictures, Nami! Like other commenters, these remind me of Chinese sweet rice balls. But I’m so much more intrigued by these with the use of mirin and soy sauce. Does the soy sauce make them salty at all? so so beautiful!! Do you know the name of the leaf used to wrap the cake in your top photos? Gosh!!!!! I love this snack!!!! 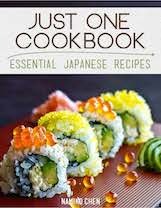 And now with your step-by-step recipe I can try making this soon, but 1st must go Daiso grab some ingredients!!!!! Oh wow Nami!! These look absolutely delicious!! Are they kinda like mochi then? What a wonderful recipe with perfect, lucid instructions! Your desserts are so much better than any I’ve made!! 🙂 And I really really looooove your photography!!! Don’t know how you do it but it’s simply PERFECT! That sweet salty sauce with teh glutinous rice texture sounds so good to me! I am enchanted that there are so many days set aside to celebrate young ones! These delicacies would please all – the children and the adults! Hi my friend, I have nominated you for the One lovely blog award! Stop by my blog to see the rules 🙂 Have a good day! I love the idea of holidays centered around and celebrating children! I think children need to know how special they are in our lives. I hope you had a great time celebrating with your family! they look so pretty nami! Haven’t tried nor heard of Mitarashi Dango…but they look delightful to eat especially with sweet red bean paste. YUM! Hope you had a wonderful Mother’s Day, Nami! 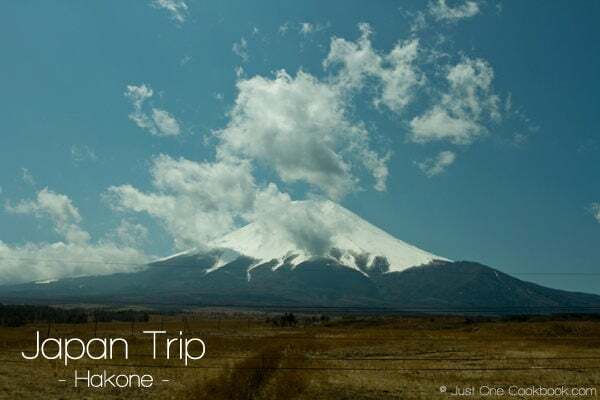 Love this post Nami, it’s so interesting to learn things about Japan! I love how informative your posts are! I love dumplings, so I’m sure I would adore this! Lovely pictures Nami! I love dango!! These look delicious! Girls day .. boys day !! Such cute festivals 🙂 Once again, i never heard of this but love the presentation and guess what i have the same plate but it’s black in color 😀 Bought it from a Japanese store. Wow, they look so good! They are so nostalgic to me, makes me want to live in Japan again! This is such a mouth-watering recipe, Nami! Love it! Hi Nami, The dumpling looks like indian sweet Ras gulla which made with (Paneer) cheese but those made with rice looks super cute………. Gorgeous photos. I’m most intrigued by the red bean paste version. Yum! Oh my goodness. What a stunning photo. I can almost taste them as I type. Just gorgeous and so different compared to sweets I’m used to. I love mochi! These look like a delicious sweet treat! What a great tradition to celebrate children’s day, and this looks so delicious! Somthing I have not tried before, but it looks amazing! I’ve have the exact same Mitarashi Dango at mitsuwa in NJ a few times. I somewhat had an idea of how the glazing sauce was made but now with your step by step recipe I can make it with confidence. Thanks for sharing this delicious recipe! 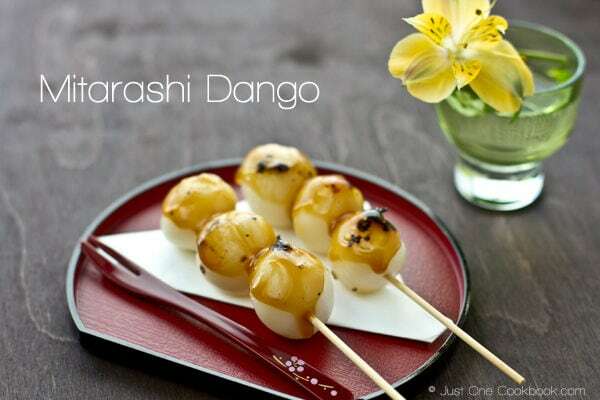 This mitarashi dango is interesting and I can imagine the smoky, caramelized flavours from the grill! Nami, this is a completely new dish for me and what a stunner! I am so excited that I found your website! I lived in Japan for 4 1/2 years (Osaka and Kanagawa-ken) and miss so many things — especially Japanese food. Your blog is the first place I have found recipes for foods I often cooked while I lived there or enjoyed in Japanese homes. Ichigo daifuku is my favorite dessert and was so excited to see the recipe here. I bought all the ingredients today and can’t wait to try making them. And I look foward to getting your cookbook too. Your pictures of Osaka … 懐かしいです! — from a very happy follower in California! 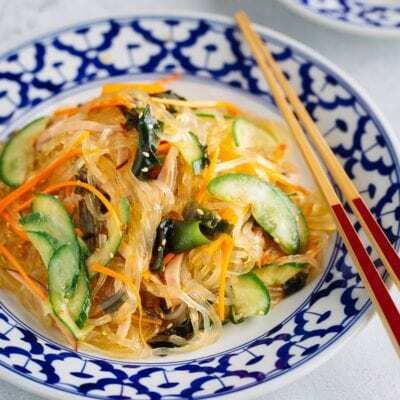 Hi, is it ok to use just the glutinous rice flour? Hi, sorry, it’s me again. I read about tofu dango. So are tofu dango and mitarashi dango similar? im confused with all the different types of dango. You’re welcome! 🙂 And thanks! Hi Nami! Do you think these dango will stay good if I freeze them and cook them whenever I like? I’m not sure if these will dry out in the freezer or remain rock hard if I pop them immediately into water or over heat. I’d love to make this for a school project, but there’s just one issue! How long does dango stay good for? You can freeze them right away in an air tight container after step 5. You can reheat by steaming it or microwave it. I’d do that if you want to keep it more than half day. If you are going to use it within 6 hours, then you can keep them in clean water (step5). Made the dango last night and topped it with the anko paste we made…so yummy! Thank you for these great recipes! Hi Brenda! I’m glad you liked this recipe! My favorite is dango with anko too! 🙂 Thank you so much for writing your feedback! 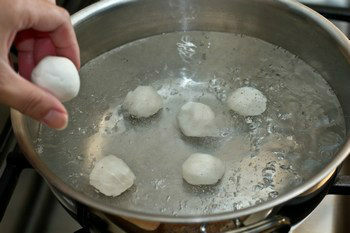 For step 5, do you remove the dango from the pot after 1 minute or 1 minute after the dango is starting to float? Hi =] thanks for the recipe! 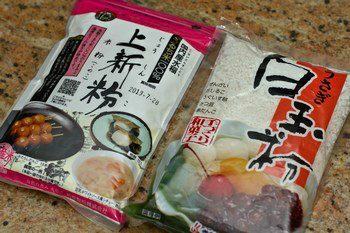 But I was wondering if I can use mochi gome rice instead of the flours cuz I couldnt find them here.. =/ Thank you! Hi Karina! Usually dango is made of powder form. Do you think you can find this brand called Mochiko? It’s widely available in non-Japanese/Asian stores. Here’s the amazon link. I was wondering what I could substitute mirin with for this recipe? I love your recipes but I always have to omit sake/mirin as I’m Muslim. I hope I’m not missing out too much in terms of flavor. You can omit sake/mirin. Mirin is used to sweeten, so you may want to replace with sugar. If sake is used for steaming, replace with water to steam. For sauce, you can either omit or add water instead. Hi Avah! I’m very sorry for my late response (I’m in Japan now and spend less time in front of computer). Hope they turned out well. Too bad matcha is expensive there. 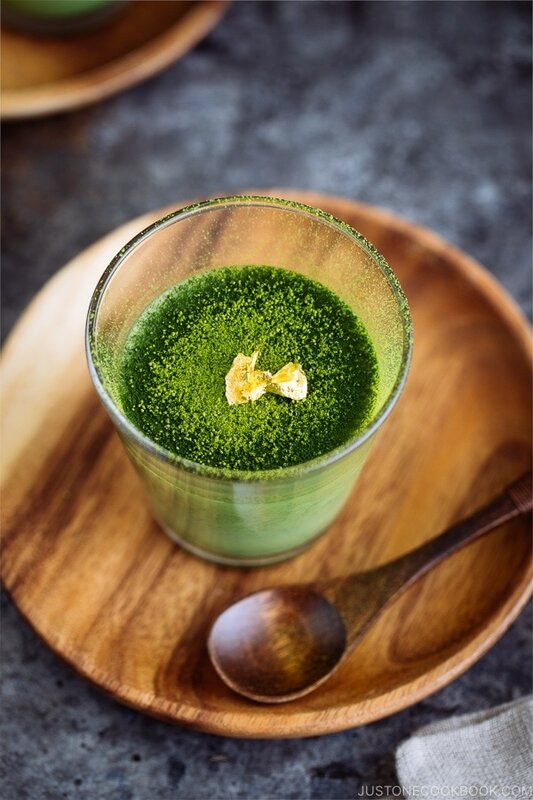 Even in Japan, matcha (real matcha) is not cheap either. 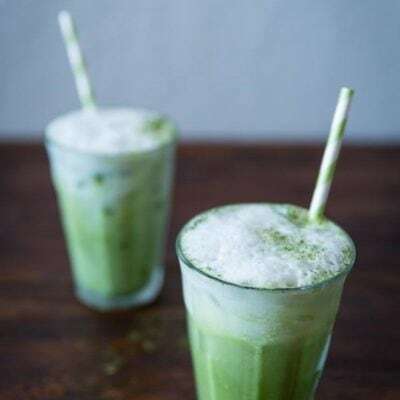 I only use good quality matcha for special occasion. 🙂 Hope dango went well. It’s the best if you make it when you eat… mochi or rice tastes best when you just make. Texture is not the same…but I know sometimes you don’t have the best option on certain circumstance. Thank you for trying the recipe! So.. is it possible to just make this with mochiko? I remember trying once, but it didn’t work out. My dough never formed. I absolutely love your recipes! I was just wondering, how long do these keep for? I was hopefully to make them the day before to take to a friends house, will they still be alright? Hi Sara! Thank you so much for your kind words. 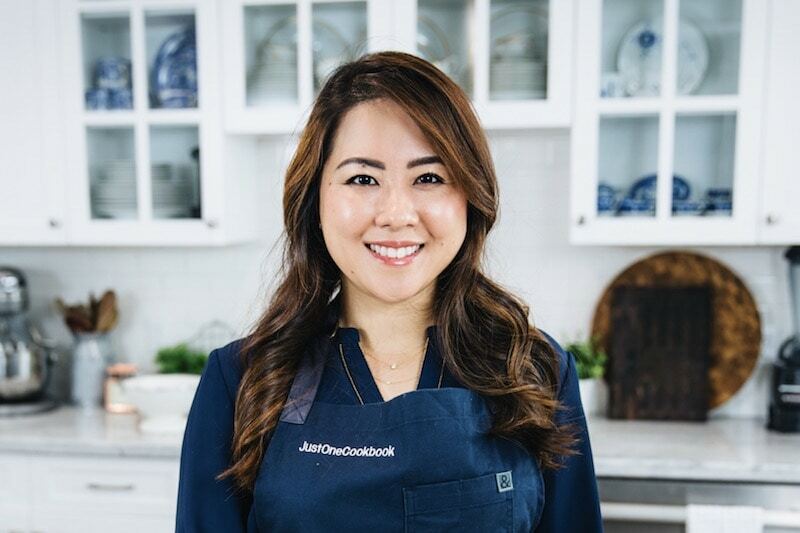 I’m so happy to hear you enjoy my recipes. You can put the dango in water and keep in the fridge for a few hours, but if you use it next day, I recommend you to freeze them to keep freshness. I updated the recipe so please read the note section. Thanks for your question! hi nami i just want to know the history of dango sticky rice balls ? we make an feasibility study of it? Can I oven grill it instead of placing it on the direct heat?If it is possible,please tellme how to. Can I also use Corn flour/Potato starch as a substitute for corn starch? Hello, Nami! Your recipe looks so delicious, the problem is, I can’t find any Joshinko to buy. Can I replace them with the usual wheat flour? How much is 100g to cups? Hmm how come when I make it the dango doesn’t come out chewy ? What am I doing wrong ? 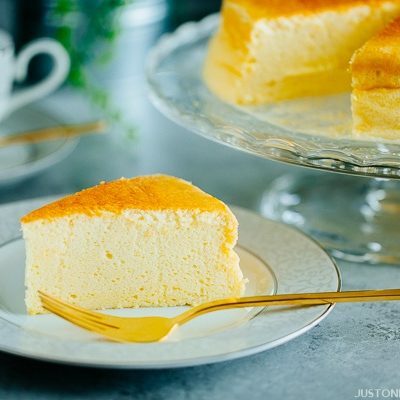 I used rice flour and the mochiko sweet rice flour for this recipe, would that be the issue? Is it necessary to grill the Dango or is it edible after boiling? Hi Nami! I finally got to make the dangos, but they came out with a floury taste(I didn’t grill it, I just boiled it). Any idea why? And also there are like little bits of… flour(? ), it’s like a crispy thing. Is that supposed to be there? I did use both Shiratamako and Joshinko, I made a few trips to the local Japanese-selling store just to get Joshinko, also explaining why it took me so long to make it (sweats). May I ask what the texture is supposed to be like? Hi Rei! Glad to hear you found both flours! Dango is soft and chewy like mochi, but not quite as sticky. The texture generally tends to be a little more ‘bouncy’. I wonder if you felt “floury” because of bouncy texture. Mochi can be pulled and extend while dango is more like a chewy and bouncy ball. Does this explanation help? Delicious! My little sister and I just made a bunch- our first time, too! We omitted mirin and shiratamako (we only had regular blended rice flour) and just added extra rice flour and sugar. They turned out really great! I’ll be sure to make these more often! Thanks! Is it necessary to grill dongo? Hello Nami, in Brazil we do not find easily shiratamako (occasionally in imported stores). Then replaces it with sweet fermented cassava (a traditional product used to make tapioca – a kind of “pancake / crepe” quite common in the country). Certainly the taste must have changed from the original, but managed to keep a good cross-cultural aspect. Hello, I was just wondering if I could substitute the rice flours for anything? There isn’t an Asian market near where I live and as I am only 12, I cannot drive. 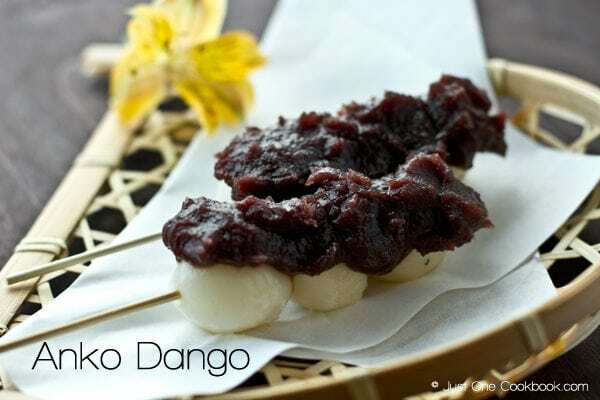 They don’t sell it at Asda or Tesco’s either and I really wish to try Dango. Is there anything I can use as a replacement? I don’t think so. I’ve looked but no where local will sell it. Is there an everday flour I can replace it with instead, like self raising flour or bread flour? Because I cannot get a hold of the Mochiko anywhere. Mochi is made from sweet rice (aka glutinous rice) and you can’t use other flour to get that mochi texture. Hi Kayleigh! Rice flour and sweet rice flour is different thing, and you can’t make mochi with rice flour. As I mentioned before, you can’t use other flour to get “mochi” texture. So please use sweet rice flour (or sometimes called glutinous rice flour). If you buy Japanese kind, it uses Japanese short grain rice, instead of Chinese long grain rice, so it’s closer to the right Japanese mochi texture. This recipe is delicious! I keep coming back to this page to make this over and over again. I love how it’s crunchy on the outside but soft on the inside and the sauce is the perfect blend of sweet stickiness. Thanks so much Nami! Thank you for the recipe. I love dango and used to eat them when I lived in Japan many years ago as a child. I just came back from a trip to Japan and had some dango. My younger brother loves them too and I’m excited to try it and make some for him. Bet he hasn’t had it years. If I want to make different colored dango, should I add food coloring before I add the water? I love this recipe ! and will be attempting to try it out. I understand some people add in silken tofu to their dango.. are you able to advise how this can change the texture of the dango ? I personally like your recipe more. But may i know what kind of sugar will you advise us to go for? Brown sugar ? White sugar? is coarse sugar or fine sugar preferred? Thanks so much! Hi Weiyun! Thank you so much. When you add tofu, the dango texture is softer than usual dango. Each tofu brand has different moisture in the tofu, so it’s best to add tofu slowly and check the texture. Tofu should be more than shiratamako. Hello! I have to say, I absolutely love your blog. I’m interested in the recipes (but will work my way through the whole way through it in time) and they’re amazing! I just tried this one and it was delicious! I just had a tiny problem when mixing flours and water, the water turned out to be too much and I had to add a bit extra flour, but it turned out delicious! I particularly liked the suggestions on how to store the dumplings, they were very useful. Take care! I’m so glad you posted this recipe! I had gotten these at a stall near a temple when I was visiting Japan. A person I met in the tour group I was in and myself got separated from the others in the group, and before I could buy more (they were so good! ), we were sent running with the tour guide before we missed our ride! I didn’t even know the name of these! I can’t wait to try them out! Hi Oleander! Haha now you know the name! And it’s pretty easy to make if you have all the ingredients. 🙂 Hope you enjoy this recipe! I just made these. I had to make a few adjustments because I only had mochiko flour, and I’m vegan/gluten-free, etc. so I had to tweak the sauce a bit. Even with those changes, it was still so amazingly good! It tastes so much like the way they tasted when I had these in Japan! For those who are curious, for the dough, I mixed things together a lot like the recipe did for the shiratama dango (the mochiko version). For the sauce, I used Bragg’s amino acids and some raw, organic agave syrup — it had a nice deep flavor and was less thick than the sauce you made, but I didn’t personally mind. Searing the mitarashi dango on the flames of my stove really helped to bring out the flavor, also! When I finally tasted them (I was waiting for the homemade miso soup I was making to heat up), they were so good that I wished I had made more (I only made enough for two skewers). I will definitely be making these again (perhaps tonight! ^-^) and will definitely share with my family! Delicious, delicious, delicious! If I get a chance to get the other rice flour, I’d love to try it that way, too! I’d suggest ordering online. 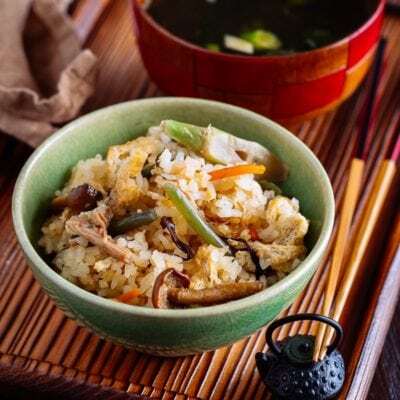 One issue you may run into is that the seller may call it “glutinous rice flour” or “rice flour” in the title, rather than by the Japanese name. Though, you should verify the name with either the seller or by looking at the product’s detailed information. It only took me two or three minutes to find these results, so they’re really not hard to find if you just do a web search for them. eBay is one of the first places I go for international items (for future reference). After that, Asian grocery stores that operate online are a good bet, if they ship to Australia. If you’re looking for something in-person, you can do a quick search for Asian grocery chains that operate in Australia. The store doesn’t even have to be Japanese — I have a health food store near me, which is run by a Korean family, and they sell Japanese Mochiko there. Other health food stores are also worth checking out — even if the store isn’t Asian at all, it could offer Asian items. Giving health food stores a call could yield some results. You’re awesome! Thank you for spending time to research for us! Hi Kaz! I’m terribly sorry for my late response. I have too many questions to answer this past weekend and didn’t see yours till now. Okay, as Oleander said below, the ingredient for the glutinous rice is different between Japanese brand and Thai (or Vietnamese or Chinese) brand. Japanese brand uses ONLY Japanese short grain glutinous rice to make the glutinous rice flour, while other Asian variations use long grain glutinous rice. They taste different and the textures are different. IF you had never had dango or any mochi desserts in Japan, you might not notice the difference. However, for someone like me who only eat Japanese dango/mochi desserts, I’d know if it’s made of other kind of glutinous rice. So it’s up to you if you want to use other variations of glutinous rice flour if that’s the only kind available to you. Hope that helps! hi i found a local store near me that sells rice flour (i didnt know because i dont really go there. and i found out on the internet lol) but they sell a variety of rice flour here are the names of ones they have :rice flour gluten free , ground rice flour, premium rice brown flour. so which one should get or should i get none of them anyways im going to keep searching cause i really like going to the store myself and getting the ingredients. Here’s a link for a recipe for Thai rice balls, so you can look at the wrapper in the picture and see if you can find that or something similar at your local store: http://thaifood.about.com/od/thaidesserts/ss/stickyriceballs.htm — It says “glutinous rice flour” on it, but the recipe is quite a bit different, so bear that in mind. That said, I’d strongly recommend against using a non-Japanese flour for the first time you make dango. The reason is twofold. First, Japanese recipes (no judgment meant, this is just my experience) are a bit more finicky/delicate than Western recipes in terms of replacing one ingredient for another. I’m a very experienced cook, and I still only come out with good results about half the time if I have to substitute something. Secondly, it’s useful to know how a recipe “should” taste before experimenting with other flours that may not have the same taste, consistency, feel, etc. I had more than one experience like this because I live in the middle of nowhere and it’s rare that I can find an ethnic/international ingredient close to where I live. For example, when I first made agar jelly (for the anmitsu recipe), I used Telephone brand agar powder, because it’s what I found by chance when I was visiting family at the other end of the country. When I used it, I was lucky that the recipe came out fine. However, when I ran out and had to get more, I ordered a different brand. I made the recipe, following it exactly as I had done before, and it came out completely different. The jelly was harder, darker in color, the taste/smell wasn’t as pleasant or light as before. Apparently this powder was stronger than the other brand, but Nami didn’t make the recipe using that powder, so even though I followed the recipe correctly, it didn’t turn out right. So with those things in mind, it’s really up to you. If you’re really so anxious to try this that you’ll get any rice flour, even if it’s not Japanese, I’d recommend to consider the experience an experiment and not get your hopes up too high. It may turn out fine, but like I said, switching out ingredients makes a huge difference in the end result, even if you’re following the recipe exactly. You’re welcome! 🙂 I hope they turn out well, however you make them. They really are delicious! Okay, if the online shop (the Oleander mentioned above) is not the option, and you can’t find the Japanese ingredients in the Asian shop, I guess you just have to make and see how it is. Like I mentioned above, it might taste fine for you. 🙂 It’ll save a lot of trouble that way. Try rice flour and glutinous rice flour both like I did (but that ratio is for Japanese flour though, hopefully same/similar). Glutinous rice flour gives springy texture that you will need. Hey Nami! It’s me agian haha! I was wondering of i could make this Dango with just 1 type of the 2 flours? I only have Mochiko flour! And is there an alternative to grill them? A regular grillpan perhaps? Hi Skye! You can use mochiko flour only, but the texture will be slightly different. 🙂 You can use grill pan too! Hope you enjoy this recipe! I found an article not too long ago that showed how to make rice cakes with water/flour and then putting them on an iron skillet and toasting them to cook. I think the person who posted that recipe was either Thai or Chinese. I’m not sure if this style is something that’s done in Japan. I’m actually making some of these right now. I did a mochiko flour mixture with water (only the one flour), mixed the dough thoroughly, then rolled it out into a long, thick rope. I cut it into sections of equal length then rolled them into balls and squashed them flat so they are about 3/4 of a centimeter thick, perhaps a little more or less at certain points. I then put them on a hot iron skillet that had nothing on it — no grease, just dry heat. I toasted them at medium-low heat until they browned (or burned…whoops!) on each side. Some of them also puff up when done — though not all of them so don’t use that as a guide. They’re very delicious like this, and a lot quicker to make because there are fewer steps. The toasted flavor is a bit different from charring them slightly on the fire, but I really like them and haven’t made them the other way since because it’s so much easier. I think if you have a food stall and you’re selling food at a festival, having things put on a stick is really nice, but at home, it’s not as quick or easy. If Nami has a version like this that’s Japanese, I hope she shares it with us! I love cooking and eating (especially eating!) these delicious foods, but don’t always have time to go through all the steps. Ahh thats sounds super. I will give it a try too =] I will also search around for the stuff i need for the recipy from Nami because i also still want to taste it authentic ^.^ Thanks alot both of you for all the tips and support! Thank you for this recipe!!! 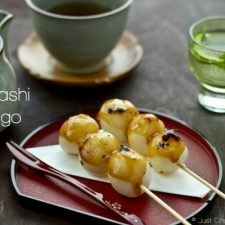 I’ve always wanted to taste dango so I gave this recipe a shot and I was extremely surprised and pleased. The only thing I messed up on was the sauce as it came out too light but it still tasted great!!! Just wondering if you also have a “Hanami Dango” recipe. Thanks again Nami!!! Highly appreciated. uhm i’m also here to report that there is a website that use your images in this recipe without link to your post as you mentioned above. Thank you so much for your kind words and I hope you enjoy this recipe! Thank you for kindly letting me know about copyright infringement. I’ll ask the site to take down my images and recipe, and if they don’t, I’ll file a DMCA to Google. It means so much to me that you let me know. THANK YOU!!!! Hi, I have a question. If I make dango today and leave it in the fridge, can I eat it tomorrow? Thank you. Hi! I’ve made dango using this recipe twice already and they’ve turned out pretty good. However, both times the dough ended up pretty soft – almost like a batter – and really sticky, so that it was hard to get the shape of the dough balls right. I’m using michiko, corn starch and rice flour (unfortunately not the Japanese kind, I couldn’t get it at the store) but it is gluten free. The first time I made the dango, I also left them in the fridge overnight, and the next day they were rock-hard. I’m pretty sure I’m doing something wrong, but I can’t figure out what – any possible solutions would be appreciated! Thank you! P.S. Regardless, I really enjoyed the dango I made using this recipe! Hi Aisha! Thank you so much for trying my recipe! I think, from what you describe, the liquid in your dough might be too much. The texture should be like ear lobe, and if it’s too loose/soft, the amount of water is too much. It might be due to different ingredients, but I’m not 100% sure why (the humidity in the air etc matters too). I don’t recommend keeping in the fridge overnight. You have to soak in water (after cooking) to keep for next day (but it can start to melt). Hope this helps! We made these last night and they were such a hit! Thank you for the recipe. We altered sauce slightly. We used 1/2 T soy sauce and 1/2 T vanilla vodka. We also did not grill the dango. We also filled some of them with berry jam and some with Nutella. Extra tasty! Thank you very much! As someone who is following a zero sugar diet after being told I am pre-diabetic, I wonder if diabetes is a problem in Asia. It seems almost every recipe from China or Japan contains sugar. I know this is a sweet recipe, but savoury recipes have sugar too. Just wondered! 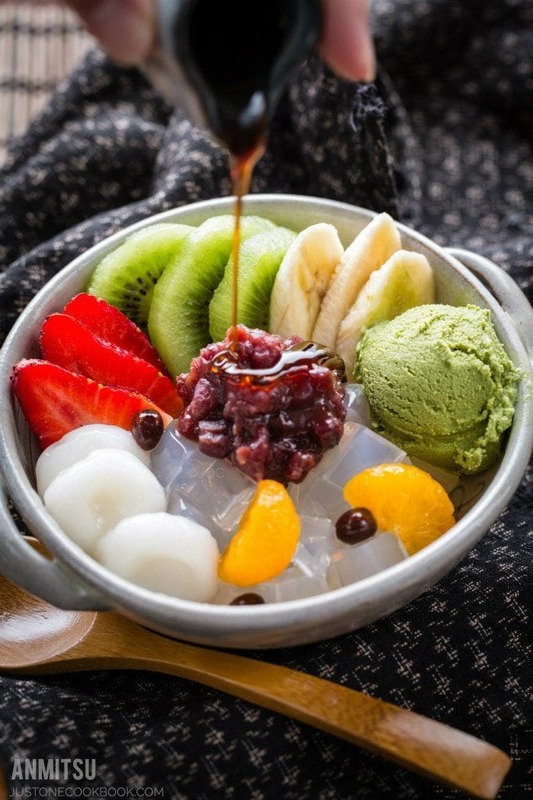 With this recipe can you also fill the dango with fillings such as sweet red bean paste before boiling them? may I know what is mirin? and where can get it? Although I have followed the recipe but the middle of my dangos are raw. Is this how it is suppose to be? Or is there something I may have done wrong? Please let me know. Thank you so much. Hi Joy! Raw as in it’s not elastic and mochi-like, right? When you were boiling, were the dango floating on top? You will need to cook at least 1 minute (just in case – floating means pretty much done). Were your dango bigger than mine? But that shouldn’t matter as long as your dango were floating…. Or do you think the texture had an issue that you thought it’s raw? Was it bouncy texture? There are no comments on this recipe! I just wanted to say it worked great for me, and I was looking it up to make dango again tonight. I froze some of them after cooking and they reheated perfectly a few days later. Thanks for posting! Whoops, there are a ton of comments and they just weren’t showing up. Anyway, great recipe! I can’t find joshinko anywhere (I’m in the US), but Amazon does have a Thai rice flour available. Do you think it would produce a similar result when used with the shiratamako? So, just to follow up, I went ahead and made this with the Thai rice flour (https://www.amazon.com/dp/B000EYC096/ref=cm_sw_r_em_apa_EY-DzbD2GT67P), and the texture was spot on ????????. The only thing I might do differently next time is add a little vanilla to the dough to add some flavor and maybe a little more sugar. Me and my daughter really enjoyed making this recipe, thank you for sharing it! Hi Liz! I apologize for my late response (I’m currently on vacation traveling abroad). Thank you so much for trying my recipe and sharing your tip! Glad to hear you and your daughter enjoyed it! I was wondering if I can make dango only with mochiko. And I bought some time ago a packet of mochigome, do you think it’s possible and a good idea to make mochiko at home? Hi Lotty! It might be too soft for “dango” texture. Dango is made from flour but mochi is made from mochigome. I’m not sure if you can make mochiko at home… sorry I’m not familiar with it. Thanks for your reply and for the information. I hope I’ll be able to find the right flour to make them. Thanks for the recipe anyway. If I can make it with the rice grinding I’ll tell you if the result is OK or not. My dango never floated to the top. I live in a rural area. I used red mills rice flour and ground up sushi rice in my spice grinder to make the sweet rice flour. Help???? Hi! Love your recipes! I’ve been following them since I found your website 6 years ago. Is there any other substitutes for joshinko and shiratamako. I’m from the Philippines and everywhere I look they aren’t sold anywhere. Hi Nami! Thanks for the reply. I’m sorry it took a while for me to reply and sad to say even if I used glutinous rice flour by itself the ones I made didn’t cook through. Even if I had boiled it for a long time. 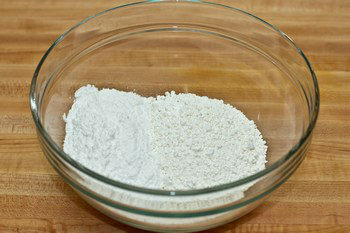 I’m going to try mixing regular rice flour and glutinous rice flour and see where it goes! Hi Carisse! Ahh I’m so sorry to hear that. Hopefully next trial will be success! Hello. I know this comment is a couple years late but I was wondering if the grilling step could be omitted. I really want to make these but I don’t have a way to do the grilling part. Thanks! I don’t know why it posted a rating. My fingers must have slipped. I just made this. This is awesome. I love how easy it is to make! I wish I grill this over a wood fire. Still, rolling it around in a lightly oiled hot wok for 5 minutes turned out pretty good. When I was a kid, my mother used to make these glutinous rice balls in some kind of syrup but I never liked it because it was just way too gooey. But dango has the perfect texture with that combination of regular rice flour and glutinous rice flour. No tofu? A lot of recipes for dango called for silken tofu and mochiko. Is this a different recipe? I made mine with just mochiko and water yesterday and they turned out great. I’ll try to add some rice flour to it next time to make them less chewy, even if I thoroughly enjoyed the stretchiness. The ingredients list has 24 bamboo skewers but “Divide into 2 equal pieces until you have 8 balls. Then divide each one into 3 equal sized balls. You will end up with 24 pieces”. So shouldn’t it be 8 skewers? Hi Kezi! Sorry for the confusion. Yes. It should be 8 skewers. This seems like a very helpful site. I wish I had read this before I made the dango. I followed a video on making dango and I’m not sure if I did mine differently than it, but my dango came out pretty…unsatisfying. I was making it with only the mochiko and I cooked mine a little bit shorter than 6 minutes. Maybe that’s why the dango came out a little hard in the inside? I also have a question; is my sauce supposed to have a stronger soy sauce taste or not? Hello Cho! Welcome to my blog! 🙂 It would be nice to see the recipe before I make any comment on it, but was the dango floating when you take them out from the boiling water? If you cook a little bit longer after floating, it should be completely cooked. It sounds like your dango was not cooked through. Depending on the size, “6 minutes” may not be accurate. Regarding the soy sauce base sauce… it’s sweet, but has soy sauce flavor. But should not be strong (salty) because sugar amount is still high. Did you use Japanese soy sauce? If these were the “dango” that Momotaro’s grandmother made for him to carry in his pouch–she would have had to forgo the sweetened soy sauce. But I have it on good authority she made kibi-dango for his journey to onigashima. Hi Bond! This is Kibi Dango and no sauce. I love that story! Is there a way to make it if you do not have a stovetop that has a direct flame? I fell in love with the savoury shoyu version of these when in Takayama! My guilty pleasure night out food in Japan was the cheese covered Dango at Torikizoku. Would the base dango recipe still be made in the same way for savoury versions?